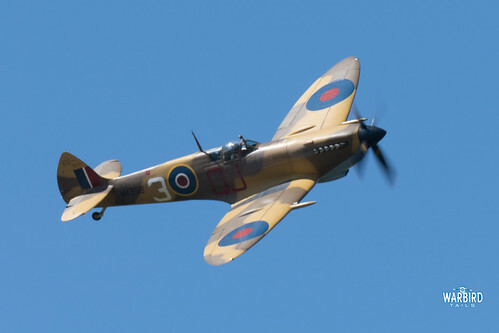 After a low-key event in 2017, 2018 saw Headcorn return as a contender on the display circuit with a busy flying programme across the weekend of 30th June and 1st July. 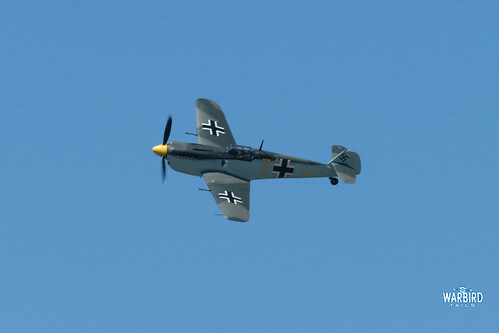 Unsurprisingly, given the hosts of the event, the flying was largely made up of Aero Legends’ machines. 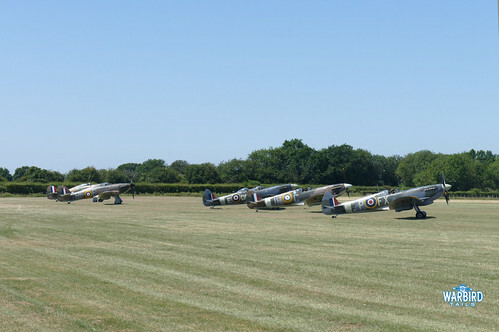 The company now boasts an ever increasing, impressive fleet of classic aircraft. Since the first Aero Legends airshow in 2015 the company have now added their own two seat Spitfire NH341 “Elizabeth”, their DH Devon, Percival Prentice and C-47 Dakota “Drag Em Oot”. The latter pair making their display debuts under the new ownership. As with past events at Headcorn there was a laid back, relaxed atmosphere. The show ground was designed with this in mind, with stalls set a distance back from the crown line providing plenty of space to watch the flying from. 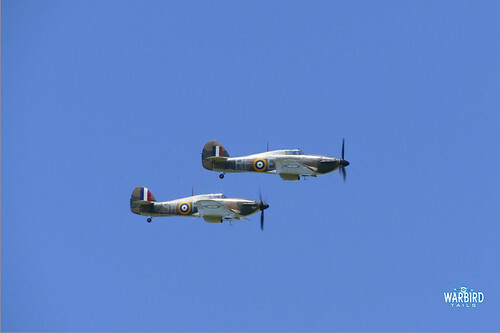 The display aircraft were positioned along with the crowd line, with notable visitors including a rare away day from the Historic Aircraft Collection’s Spitfire and Hurricane pair. The display took place in three sections. With the first part consisting largely of Aero Legends types. 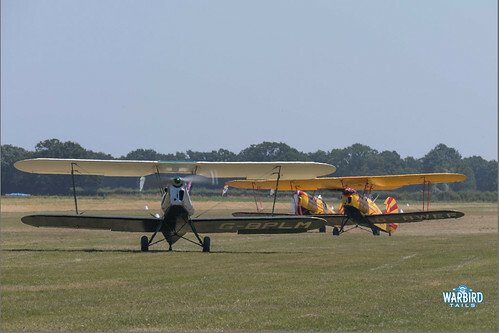 A biplane formation kicked things off with the Stampe display team being joined by Aero Legends’ Tiger Moth pair and Jackaroo. The Stampe team then proceeded to complete their typically stylish display topped off by spirited solo aerobatics. 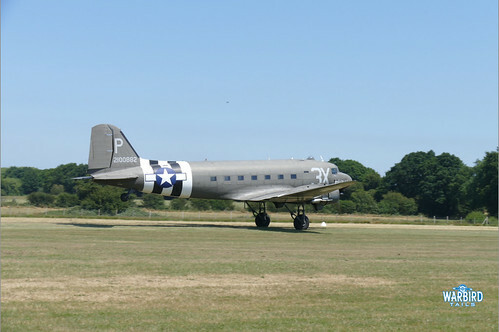 The latest addition to the fleet, C-47 Drag Em Oot flew two memorable displays across the afternoon. Simply watching this machine operate up close at Headcorn is impressive enough but to then watch as this large airframe gracefully wheels into a full display is something else. 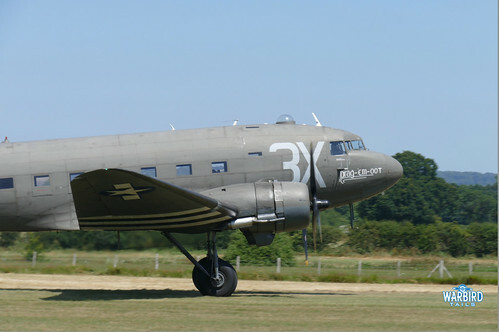 On the Sunday of the show the second display slot saw the Dakota drop a number of paratroopers, complete with classic “round” parachutes. This is something that has not been seen at a UK show for some years and poignant given that this example is a D-Day veteran. Aero Legends’ Harvard flew in a pairs sequence with Rob Davies’ example. Two T-6s never fail to make an impression with a real assault on the senses. Both aircraft performed short aerobatic sequences as part of the routine also. Having entertained the waiting crowds in the morning, it was soon time for both of Aero Legend’s Spitfires to make their first appearance in the flying display. 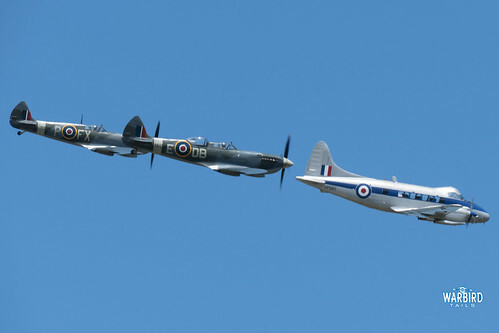 In a graceful demonstration of the “fly with” offering both Spitfires formed up with the de Havilland Devon for a few passes, before the Devon flew a very brief display. After this the Spitfires closed off the first flying segment with a graceful tail chase. After a short lunch break, it was soon time for the headline event of the show. 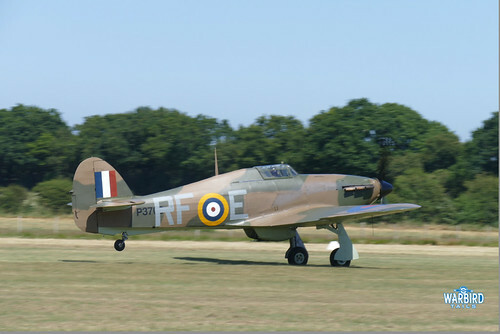 This saw the three Spitfires already on the ground taxy out, accompanied by both visiting Hurricanes (G-HITT and G-HURI) before getting airborne in a dramatic scramble sequence. 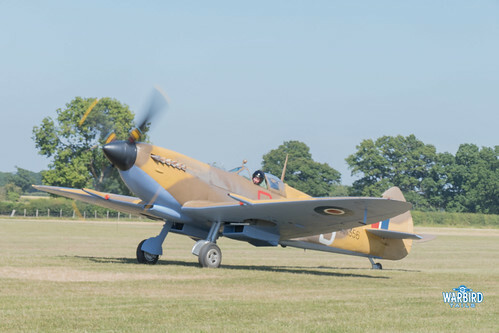 Once formed up the formation was joined by the Battle Of Britain Memorial Flight’s Spitfire IX, recently repainted into Neville Duke’s Desert Air Force colours. In all honesty, this segment lacked the impact that might have been expected. Don’t get me wrong it is wonderful to see this level of warbird gathering away from Duxford, but the display itself was missing something. The fighters flew in waves of two or three in a racetrack “American style” pattern. This may have been a limitation of the approved display line, but I’m not sure. A tail chase, or perhaps solos from the HAC machines would have undoubtedly pushed this sequence into aviation folk-lore. 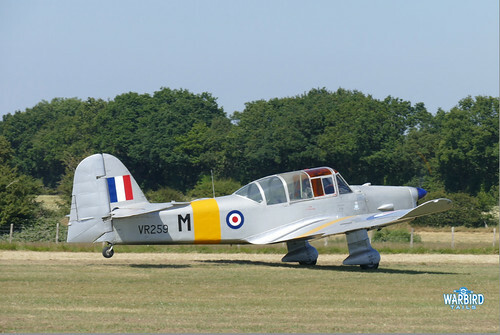 The final short flying sequence got underway in fine style with a screaming, in from the sun arrival by Richard Grace in Buchon Yellow 7, making its debut airshow performance following restoration at Sywell. This was everything you would expect with Mr Grace at the helm, close, low flypasts with some graceful aerobatics thrown in. 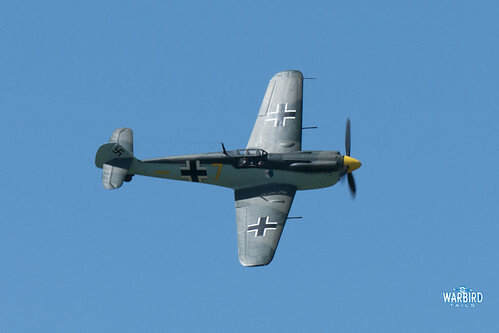 While it was a shame the Buchon didn’t base out of Duxford, it certainly helped it make a surprise arrival. Parky quickly scrambled in TD314 to see the Buchon off and flew in a graceful tail chase sequence before delivering his own powerful solo in the Spitfire. Not to be outdone, the (at the time) BBMF boss Andy Millikin got airborne in Spitfire IX MK356 for what I can only describe as the best BBMF solo display I’ve ever seen. Initially flying a flypast slot (this typically consists of three close in passes) before moving into a full solo display. This slot featured plenty of vertical aerobatics, including a wonderful on crowd half cuban, complete with flowing topsides, certainly a highlight of the day. The show was then brought to a close on a slightly lighter note, with the unusual pairing of Dakota and Prentice. The latter of which must have been making the first airshow appearance for the type in some years. After an incredible debut event in 2015 and a slight falter in 2017, this years’ show at Headcorn shows that Aero Legends have the potential to make something special. Headcorn has the potential to be one of the must attend airshows and a few tweaks could easily achieve that. While the Battle of Britain theme is commendable and of course fitting given Aero Legends’ involvement, it would be nice to see the airfields significant USAAF history honoured. Perhaps with next years D-Day Anniversary the P-47 and a Mustang could be invited down. That would certainly be a sight to behold.